When you attempt to lose weight, it's often important to familiarize yourself with the calories you burn versus those you consume through your diet. Increasing your physical activity while cutting down on your caloric intake is the key to weight loss. Although you might make smart dietary choices, it's easy to unknowingly increase your caloric intake through the addition of many condiments. 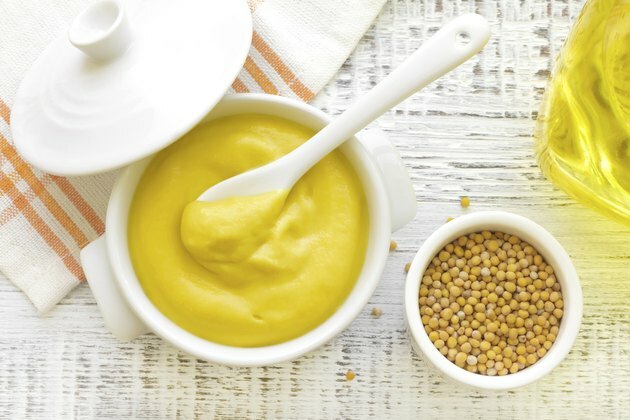 Mustard, however, is an ideal choice because of its low caloric value. If you take care to make a sandwich with low-calorie bread, lean luncheon meat and low-calorie cheese, you might negate your vigilance by making the mistake of loading the sandwich with condiments that can easily add dozens of calories. Instead, opt for mustard. A 1.5-teaspoon serving of yellow mustard, with virtually no sugar, adds only 5 calories to your sandwich. Other condiments are higher in calories. A tablespoon of reduced-fat mayonnaise made with olive oil has 54 calories, and a tablespoon of ketchup has 19 calories. One tablespoon of sweet relish has 20 calories.